COLUMBIA, Mo. — Missouri locked down on the final defensive possession and squeaked by Arkansas 79-78 Tuesday night at Mizzou Arena. Missouri’s Jeremiah Tilmon did not allow Harris to get a quality shot off, and the ball was tipped back to him as time expired. Tilmon led Missouri with 21 points. Senior Jordan Geist contributed 18 points. Arkansas lost despite committing just 12 turnovers. However, the Tigers committed just 11 turnovers and shot 50 percent from the field in the second half. Gafford led Arkansas with 26 points on 12-of-17 shooting. He scored the Razorbacks’ first 10 points of the game. Isaiah Joe added 17points and Mason Jones had 12. Joe made four 3-pointers to give him 86 for the season, setting the Arkansas record for treys made by a freshman in a season. Arkansas will return home for the first of four straight Saturday home games versus Mississippi State on Feb. 16. Tip-off at Bud Walton Arena is set for 7:30 pm. Daniel Gafford scored Arkansas’ first 10 points and 14 of the first 17. After Arkansas missed its first eight 3-pointers until Isaiah Joe sank a triple with 7:55 left. With that, he tied the Arkansas freshman record for 3-pointers made in a season with 83, tying the total Rotnei Clarke made in 2009. At times, it looked like Missouri would put the game away, leading by as many as 14, and at times it looked like Arkansas was going to get right back in it, getting to within six once and seven twice. The Tigers were 8-of-10 at the line and the Razorbacks were 9-of-12. Missouri would ultimately lead by 10 (46-36) at halftime. The Tigers made six 3-pointers, compared to one by the Razorbacks, and only had four turnovers, compared to nine by the Razorbacks. Daniel Gafford led the Razorbacks with 16 first-half points. SECOND HALF: Arkansas out-scored the Tigers 42-33. Isaiah Joe made a 3-pointer at 17:50, his 84th of the year, to break the school’s freshman record for 3‘s made in a season. Down 10 (65-55) with 9:19 left, Mason Jones made a 3-pointer and an old-fashion 3-pointer to get the Razorbacks to within four, 65-61. After a couple chances to get closer by the Razorbacks, Ronnie Suggs hit a 3-pointer in the corner to put the Tigers back up seven with 5:09 remaining. Suggs was just 2-of-12 from 3-point range entering the game. Daniel Gafford made back-to-back, old-fashion 3-point plays to get to within three, 72-69, at 3:37. Arkansas’ starters were Isaiah Joe (G) – Jalen Harris (G) – Mason Jones (G) – Adrio Bailey (F) – Daniel Gafford (F). This has been Arkansas’ starting lineup in 22 of its 24 games. Arkansas controlled the tip. Daniel Gafford scored the first points of the game, a jump hook in the lane at 19:47. This was the 51st all-time meeting between Arkansas and Missouri – and the second this season. The Razorbacks, which won 70-62 in Fayetteville on Feb. 23, own a 27-24 advantage in the all-time series. The Tigers are 15-10 in games played in Columbia, but the Razorbacks hold an 8-6 advantage in games since Missouri joined the SEC in 2013. Arkansas lost for the second straight game despite committing less than 15 turnovers. The Razorbacks are now 9-2 when committing less than 15 turnovers. In addition to setting the freshman record for 3-pointers made in a season, Joe entered the school’s overall top 10 list for triples in a season. His 86 rank 10th, surpassing Scotty Thurman (1993) and Daryl Macon (2018) for 10th. Scotty Thurman holds the single-season record with 102 made in 1994. Arkansas had six dunks, giving the team 105 for the season. 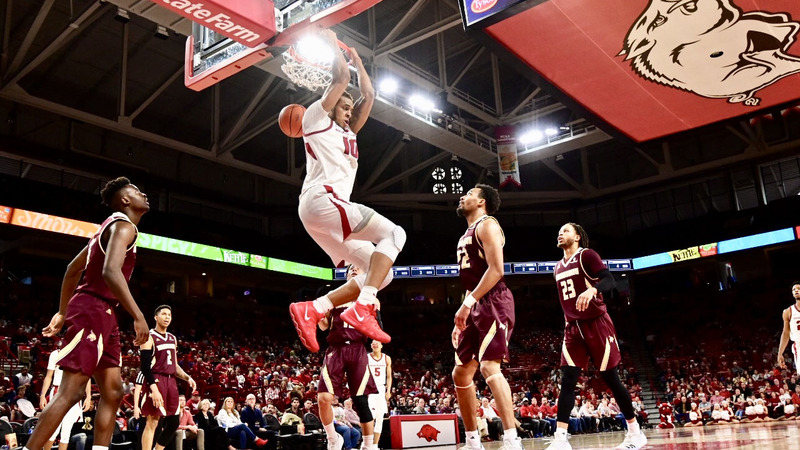 This is the third time in the Mike Anderson era Arkansas has recorded at least 100 dunks, including a record 124 last season.